Great play of shadows. Well find. Now that made me say ooh! Out loud! This is delightful and the shadow helps us to see the tree more clearly. Great capture - I like that the gate is slightly open. Pretty shadows on the cobblestones. 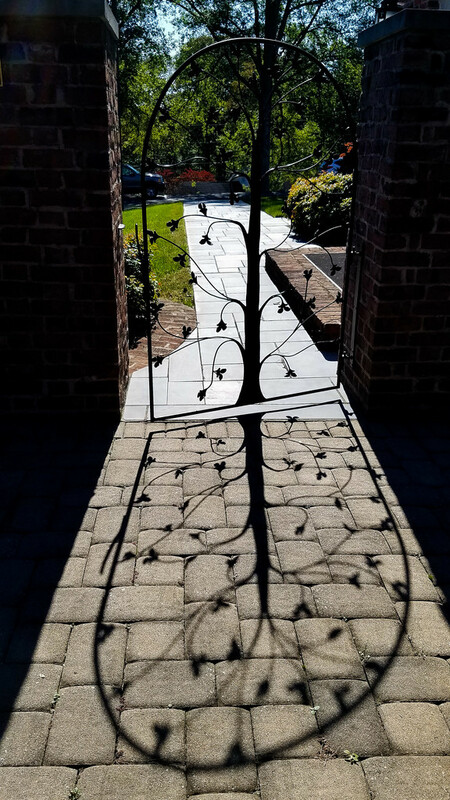 A great capture of this beautiful gate and it`s shadows. Now that's a pretty shadow! And the pavers add a really nice texture to it too. @thewatersphotos It's a lovely iron gate. Thanks Gary. @haskar Thank you. It's at the church I attend. @vignouse Thank you Richard. The sun was at just the right angle. It was actually a bit seeing the subject in the camera because it was so bright. @mandygravil Thank you. I was getting ready to leave and saw this view. @tunia Thank you so much Tunia. Oooh, I love that shadow. Beautifully composed. @mcsiegle Thank you so much Mary. @homeschoolmom Thank you, too, Lisa. Absolutely Beautiful!!! Great capture, Kathy!!! @rhernan Oh thank you so much. I sure appreciate your kind words.